Studio apartment of 30 m2 on top (4th) floor of a chalet style building in the centre of the resort of Courchevel Moriond (1650), accessed by stairs. Comfortably sleeps 4, ideal for a family of four, or two couples. Excellent location, right next to the nursery slopes and the main Ariondaz gondola, and being situated in the centre of the resort, the apartment is very close to many of the bars, restaurants and shops. The apartment was modernised in 2016 and is fully equipped for a self catering holiday, with high quality kitchen units and brand new appliances (oven, induction hob, microwave, dishwasher & fridge), and the electric sockets have a mixture of English and French fittings. There is a double sofa bed in the living area, and two 'clic clac' beds complete with comfortable mattresses on the mezzanine floor, which can be pushed together to form a double bed. 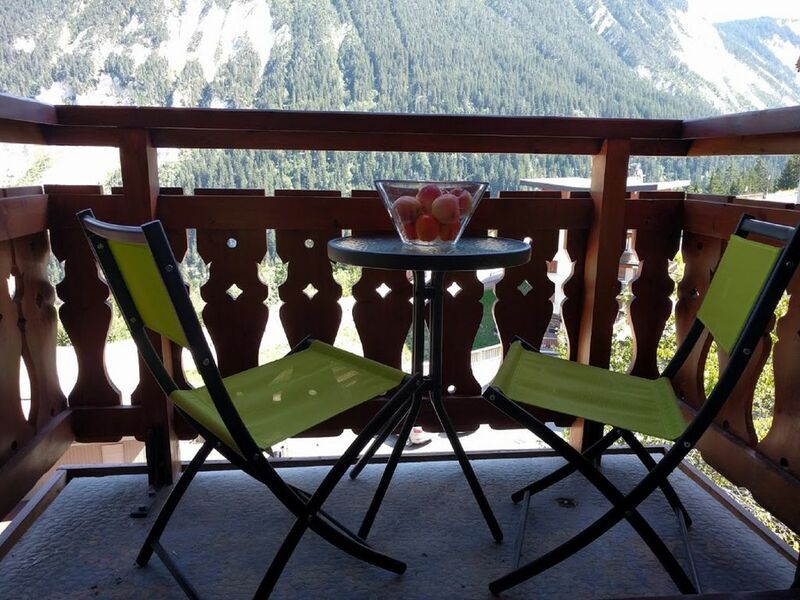 Small balcony with views of the Dent du Villard and looking over to the resort of La Plagne. We have 2 ski lockers suitable for skis and boots, and a larger ski locker which is beg enough to hold suitcases or larger items. is run by John & Julie Moore, who live in S.E. England, and are both music lovers, playing violin at Maidstone Symphony Orchestra. We bought our first apartment in Courchevel in 2001 and love visiting the resort, never tiring of the fantastic skiing facilities offered in the Three Valleys. We had skied in Courchevel before, and loved the vast skiing area, but knew that, to ski every piste in the Three Valleys would mean returning for several years! Moriond 1650 is a family orientated resort with charming character, and appealed to us with its interesting variety of shops and restaurants. The Marquis apartment offers genuine ski-in/ski-out facilities, and being so close to the nursery slopes, it's ideal for young families in particular, and those wishing to be close to the bars and restaurants. We ski several times each year, and have never tired of skiing in this fantastic resort. Genuine ski-in/ski-out. Being so close to the nursery slopes where ski school starts and finishes, the location is ideal for those wishing to return to the apartment for lunch. During the summer months, there are some great walks through the woods and down to Lac Rosiere, and one often wakes to the sound of bells from the local Beaufort cows, as they graze on the luscious green mountain pastures. Wi-Fi has been installed within our apartment for the benefit of guests. Samsung flatscreen LCD TV with USB socket suitable for memory stick, so you can watch your pre-recorded films. Samsung Blu-Ray DVD player with remote control. Courchevel 1650 has some gentle nursery slopes near the gondola, and there's a free drag lifs, so beginners don't need to buy a lift pass to use the Mickey green run. Pour la deuxième année nous avons passé un excellent séjour. L'emplacement de l'appartement est parfait, au pied du front de neige et des commerces. John le propriétaire est de très bon conseil et la communication très aisée. Good updated amenities, excellent kitchen for cooking, all the basics and a full stove. Loft provides a nice separation of space. We've been visiting the trois vallees for skiing for many years and Courchevel 1650 is our favorite location. This was the nicest apartment we have stayed in to date. It was very well maintained, clean and well equipped. It was actually a little bigger than we had thought from the photos. Good WiFi too. We used the upstairs beds which were comfortable (you just had to remember to mind you head on the sloping roof when standing up). The apartment is very well located, with the Spar supermarket and restaurants just opposite and the escalator to the telecabins only a short walk away. But because its facing the back road, it was nice and quiet. The only slight negative is that there is no lift to this 4th floor apartment, but we needed the exercise anyway! The owners were helpful and provided plenty of useful information. All in all we were very pleased with the apartment and would recommend it to friends. Really pleased you enjoyed staying in our apartment John, glad you had a good holiday. We're pleased you enjoyed staying in our apartment. This was the first time in 14 years we've had a problem with the key, so we appreciate your understanding while we arranged its replacement as soon as we could.